Warning: This review and comparison of the Smashbox Lash Primer and Shiseido Nourishing Mascara Base contains pictures of me with ZERO MAKEUP and ZERO EDITING. HAHA! I didn’t want to wear makeup just to do a visual review and comparison of these two lash primers! You should take a minute first to think whether to click on ‘Read the rest of this entry’, LOL! Alright! Take a breather first before I let you see a makeup-free me. My first experience with an eyelash primer was with Smashbox Lash Primer. The store assistant at Sephora Ion Orchard recommended it to me, saying that this eyelash primer would hold curl and keep mascara on the whole day. I still like it a lot, it really does a good job of conditioning the lashes with its creamy formula and makes them full and plumpy before mascara application. One thing I didn’t like so much about it was that it dried white. Sometimes even when I make sure I coat every lash with mascara I still see some lashes peeking out in white, and under the blanket of blackened eyelashes, the white lashes become, erm, the black sheep of the family. I wanted a formula that would dry transparent and from my sniffing about I found the Shiseido Nourishing Mascara Base! The Shiseido Nourishing Mascara Base is a newly formulated product in replacement of its predecessor the Shiseido Makeup Mascara Base, which has a fatter handle, thicker wand and drier forumla. The latter has been discontinued much to the dismay of many. So sorry if I scared you! I mentioned earlier that I don’t how that the Smashbox primer dries white coz white coated lashes under black mascara are so ugly! I love that the Shiseido Nourishing Mascara Base is a greyish-clear color color rather than opaque white like the Smashbox one. The greyish-clear color lets you see which areas you have had covered yet at the same time doesn’t glare strikingly when you miss coating mascara on some individual lashes later on (especially at the outer corners of the eyes). You’ll see that your lashes ‘glisten’ once it’s been coated with the Shiseido lash primer. However I would advise not to wear the Shiseido Nourishing Mascara Base on its own. It WAS intended to be applied underneath mascara and not act as a transparent mascara per se. I’ve had no problems with application for both the Smashbox Lash Primer and Shiseido Nourishing Mascara Base. Both glide on well and do not clump. The only slight difference is that the Smashbox one is a little creamier in texture while the Shiseido one is more diluted and less rich. The basic principle behind an eyelash primer or mascara base is that it creates a layer atop your eyelashes for the mascara to adhere to, so that it gives a longer-lasting effect, reduces flakiness and prevents smudging. The Shiseido Nourishing Mascara Base wins hands down for this function. It holds a curl like ten times stronger and more effectively than the Smashbox Lash Primer. With the Smashbox one my eyelashes look all well-curled after crimping with the best Shu Uemura eyelash curler but after some time they tend to droop due to gravity and the fact that Asian lashes tend to point downwards. Of course it is much worse without an eyelash primer at all. I could never wear mascara without a lash primer anymore. With the Smashbox lash primer I have to curl more to ensure that my lashes stay curled upon mascara application; with the Shiseido lash primer I sometimes have to pull back the crimping otherwise I will look SURPRISED all day! This means that you only need little effort with crimping to get awesomely curled lashes with the Shiseido Nourishing Mascara Base. The Shiseido lash primer guarantees that my lashes stay all curvy and fluttery all day! In my opinion, I feel that the Shiseido lash primer does a better job at lengthening while the Smashbox lash primer does a better job at volumizing. As with all my makeup, I never have trouble removing even the most waterproof or smudgeproof of mascara with an oil-based makeup remover like my cheap and awesome Biore Makeup Remover for Eye & Lip. So there is no difference in the ease of removal for both Shiseido and Smashbox lash primers. It’s not hard to guess which one I prefer. So if you want your well-curled eyelashes to stay that way the whole day, get the Shiseido Nourishing Mascara Base! 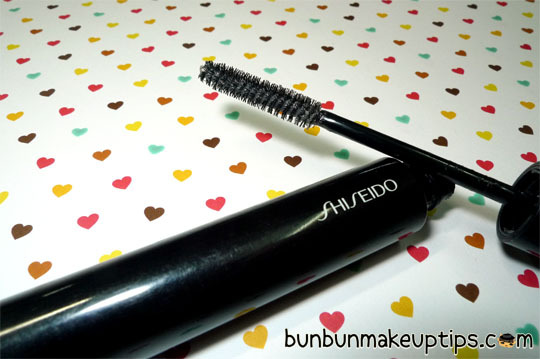 Bun Bun gives her vote to Shiseido Nourising Mascara Base! So tell us, what eyelash primer works for you?